Receding gums is a dental condition in which the gums pull back from the tooth surface and expose the teeth’s root surfaces. Receding gums is just one form of gum disease – a serious consequence of poor oral health and nutrition and which may lead to tooth loss. Gums recede for various reasons. This includes overaggressive brushing, poor oral hygiene routine, teeth grinding and gum disease. Receding gums must be treated as soon as possible as exposed roots are prone to develop tooth decay, and over time lead to tooth loss and periodontal disease. 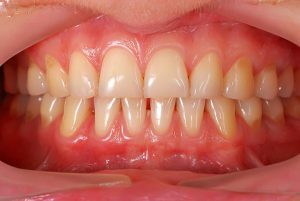 There are many treatments available for receding gums, which will depend on the severity of amount of tissue loss. The earlier the treatment, the better the result. At Cardiff Dental, we help you get the best solution for receding gums. Treatment for Receding Gums will depend on the level of gum recession as well as the amount of damage to the underlying bone. The dentist will perform scaling and root planning to get rid of plaque and calculus if there is sufficient tissue remaining in your gums to act as a barrier against disease and bone loss. For excessive gum recession, this may require dental surgery. Gum grafting can be performed under local anaesthesia or conscious sedation. Without treatment for gum recession, tooth loss is almost unavoidable. To avoid the onset of receding gums and other gum problems, seek help from a dental professional. Your doctors at Cardiff Dental can help keep any gum disease under control. We will educate you on oral hygiene and will schedule regular dental visits to monitor your condition. If you have any questions about gum recession and periodontal disease, we will be happy to answer them and recommend the best solution for your problem. Contact us on (02) 4954 6888 today!